It's May! That time of year when all of a sudden my calendar starts to become ineligible because it is over flowing with activities (baseball, golf, play practice, award ceremonies, teacher appreciation, end of year picnics, etc.) 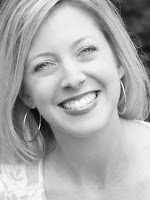 Things like blogging take a back seat, probably for you too, so if you are reading, I thank you!! In anticipation of the craziness of this month, I kept my consulting calendar pretty light, which has allowed me some extra time to work on projects in my own home, mainly the office. I have a pretty modest budget for the office, so when the workroom quotes for roman shades came in, I was a bit stumped by the high cost of labor. I did a little research, found a plethora of online tutorials, inspected my girlfriend's shades and decided to attempt to sew my own. I am not an experienced seamstress at all. 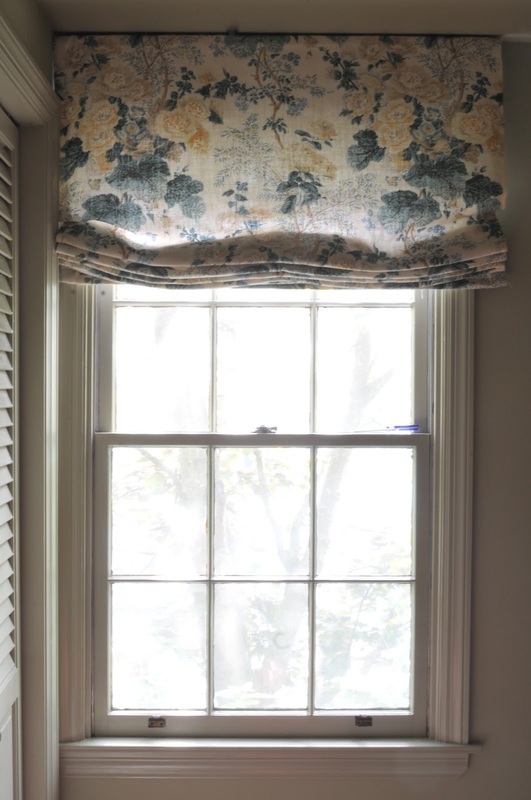 My skill set is just just beyond threading the machine and winding a bobbin, so when these turned out so beautiful, I knew I would want to share my process. If I can do it, you can too. 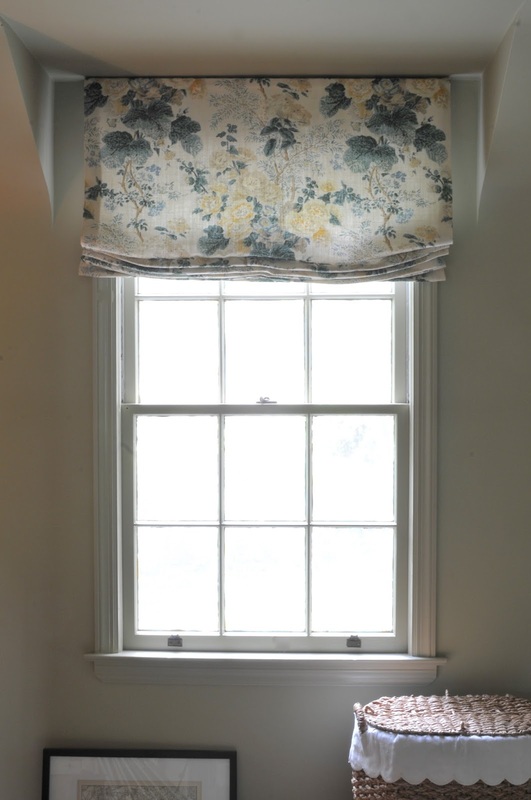 I did make a test run shade that I hung in our powder room with some spare fabric before I cut into office shade fabric. I'm not totally crazy. First, these shades are a bit of cross between a relaxed and flat roman. If I had used dowel rods at every pleat they would have the very tailored and structured look of a flat roman. I didn't want that in this space, but I also didn't want a completely relaxed and flouncy roman either. These are sort of in between, lots of stacked pleats like a flat but with a bit of the movement and casualness of a relaxed roman. Measure desired shade size, length and width. Have 1x2" board + dowel rod cut to size. 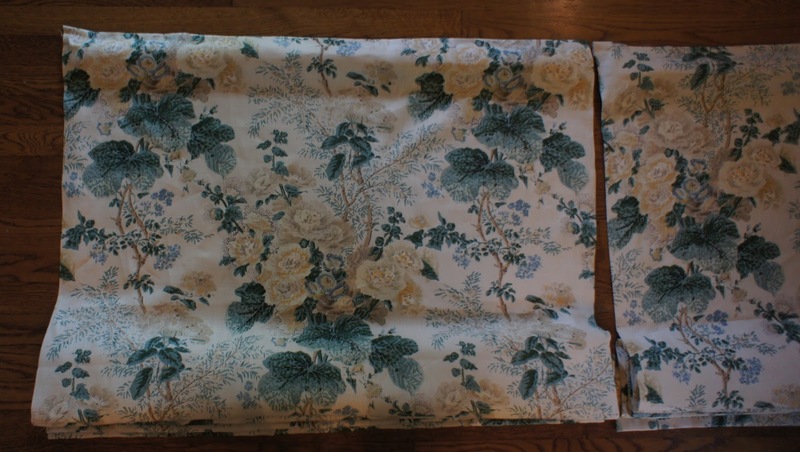 Place right sides of fabric facing each other. Line up edge of lining fabric with edge of shade fabric and pin on one side. 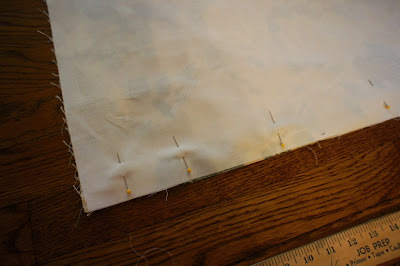 Sew a 1/4 inch hem along the pinned side of the fabric. 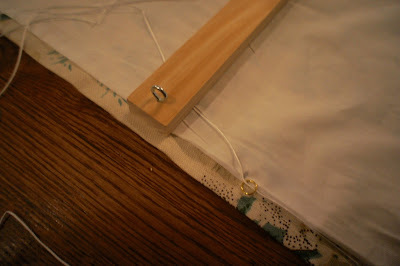 Remove from machine and pull the lining across to the non-hemmed side of the shade fabric and pin. 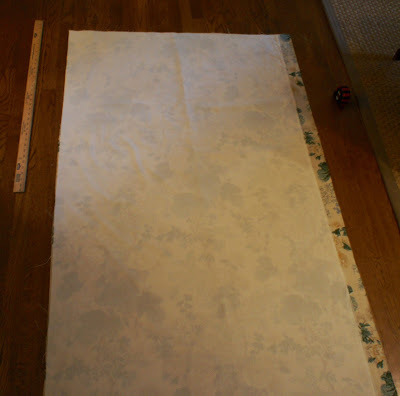 Sew a 1/4 inch hem on the other side. Turn fabric right side out. Iron the shade. Double check that it is the correct width for the finished shade. Then fold top of shade over twice, an inch each time, and press. Sew top hem. 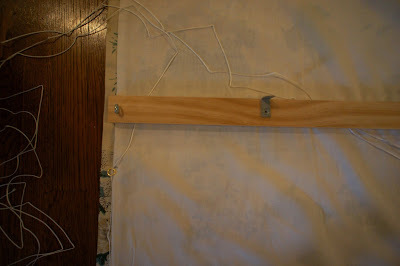 For the bottom hem you are going to create a pocket for the only dowel rod you will use for this shade. 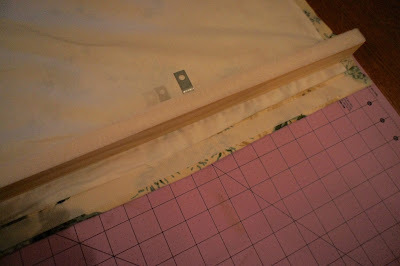 Sew a 1/2" hem and then fold over 1.5" and sew another leaving an opening for the rod. That's it for the sewing machine! I used a yard stick and a pencil. You will make three columns of rings on the back of the shade. Spacing: Place pleats 8-12 inches apart. I did mine 8 inches. Starting Point: Take your desired spacing and divide by 2, then add one inch. This is your where your first row of rings will be. For example, my pleat spacing is 8 inches, so my first row of rings was placed 5 inches from the bottom of my shade. (8 divided by 2 plus 1 = 5). Hand sew the rings in place. I folded the shade in half to find my middle and then marked it lightly with a pencil so my center column of rings would be straight. 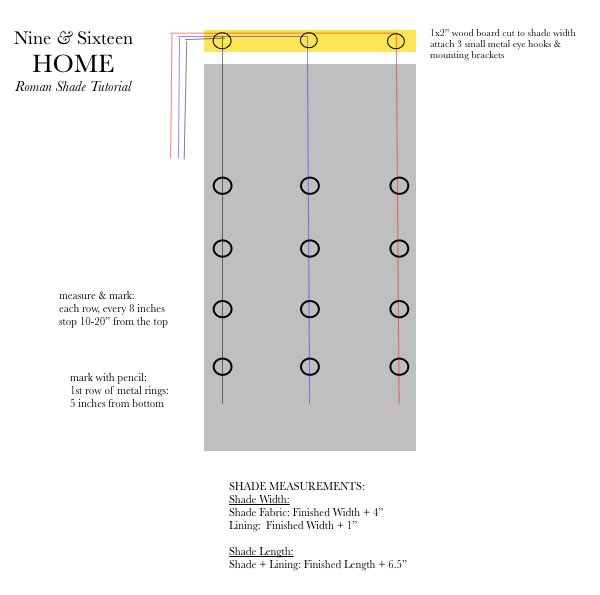 Keep measuring up 8 inches from the last row to sew your next row. I stopped 20 inches from the top of the shade. This was the step I dreaded the most and it wasn't that bad. I sewed each ring about 5-6 times and then tied in about 3-4 knots. Each shade took about 20-30 minutes to measure + sew on the rings. I laid the shades side by side to get a sense of how finished shade would look. You can see here how the fabric repeat that is showing on each shade differs. I love this fabric so much and since it will be in the up position most of the time, I like being able to see the two different views. If I wanted them identical I would have needed more yardage. Should have ironed a bit better. I lined up the board with the shade and marked where eye hooks should go. I pre-drilled holes and then screwed them in. Attach L brackets, pre-drill holes and them screw in. See diagram for how the string flows through the hooks. The string farthest away from where you will pull and lower will be the longest and go through all three hooks on the board, the middle string will go through two and the side where you will lift and lower, only one. Attach the string to the bottom ring with a few knots and then thread it up through the ones above. The desk will go right in front of this window. Not sure why I didn't place it here before, but as soon as I did it made such a big difference in the room.